Also known as ‘Summer Hyacinth’ Galtonia candicansare summer flowering species originally from South Africa. 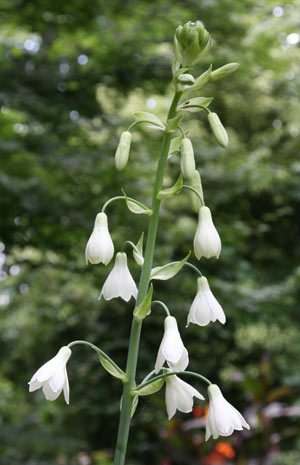 A tall growing summer flowering fragrant bulb (to nearly 1m) that requires a sunny position to flower well. Large pure white bell shaped flowers (pictured right) are long lasting and are held on strong stems. G candicans are best planted on clumps of 6-10 where the mass of flowers makes a spectacular show. Bulbs need to planted in a well drained humus rich soil, a depth of around 10cm and 15 – 20cm apart. We like to fertilize with a seaweed based liquid fertilizer in spring. Keep moist during the growing season, bur withhold water during winter. Winter dormancy makes these bulbs fairly frost tolerant, unless they recieve very late frosts. Snails and slugs are attracted to new growth, so use the normal controls here. Galtonia candicans need good drainage, especially in winter or they may be susceptible to rot, although this has not been a problem for us in a high rainfall area. Larger clumps can be divided in late winter as required. These bulbs have been renamed and are now properly known as Ornithogalum candicans (syn. galtonia candicans), so do not get confused, they are one and the same.